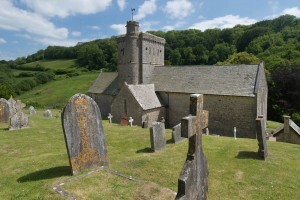 Branscombe Church is holding a special Open Day with the annual market at the church on Saturday 15th July from 10.30-3.00 pm. Come and enjoy – Trips us the church tower – Guided historical tours – Amazing parachuting teddy bears off the tower at 2.30 – light lunches, coffee and refreshments – various stalls. 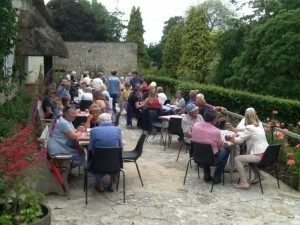 The very popular cream tea at Musbury Barton returns this year on Sunday 9th July from 3.00-5.00 pm, by kind invitation of Lt Col Tony Drake. The St Michael’s Summer Concert this year is on Saturday 8th July at 12 noon, with Alex Davies, organ, Alison Davies, Saxophone and David Fouracre, Baritone. Followed by ploughman’s lunch including dessert and tea or coffee. Tickets £8 in advance from The Little Shop Colyton or Colyford Post Office; or £10 on the day. Under 18s free. All proceeds to the organ fund. See St Andrew’s church transformed into the Holy Land…. Different areas represent different parts of Jesus’ life and ministry, and story tellers are there to fill in the picture. Please see earlier post for details of opening times and evening events between Wed 21st and Sun 25th June. The mystery revealed! Children at Messy Church enjoyed thinking about the God we worship, Father, Son and Holy Spirit, on Trinity Sunday. At the end of the days of prayer in response to the Archbishops’ call, people from all over Devon gathered in Exeter cathedral at Pentecost to worship and celebrate. This is the East end of Devon where we put the Holyford MC boxes. We walked round the Cathedral during the service visiting the many prayer stations prepared by various organisations e.g. Christian Aid, Street Pastors, Childrens’ Work, the Gideon and the Homeless. There were Prayer activities at most of them. June is marching on, so it’s time to think about our next Breakfast Service at St Andrew’s Church – on Sunday 18 June, Fathers’ Day. We’ll be celebrating Dads, Mums, family life in general, and God’s love for us all. As usual, we begin with breakfast at 10.00 followed by a short all-age service beginning at 10.30 and lasting around 35 minutes. We received a very positive response and a big turnout for our first Breakfast Service, along with useful feedback about what’s helpful for families with young children. On 18 June the story and a number of other activities will be specifically aimed at children, who will be given a BUSY BAG (a surprise with a Father’s Day flavour) as the service begins, and plenty to do as we go along. Do please promote/ share/ invite your friends…..
Bible Study is continuing in Branscombe at 3 Mill Lane on Friday 21st April and 12th May, 2.30-4.00 pm. Phone 01297 22303. The summer dates for the Musbury group at Knap Orchard, Combpyne Rd, Tuesdays 7.30-9.00, (phone 553180) are 16th and 30th May, 13th June, 4th and 18th July. The Colyton group at Forecourt, South Square meets on Thursdays, 7.30-9.00, (phone 551400), dates 4th and 18th May, 1st and 22nd June, 6th and 20th July. Everyone from any of the churches is welcome at any of the groups. From June 21st to 25th St Andrew’s Colyton will be transformed into the Holy Land. A major interactive exhibition will recreate important locations in the life of Jesus. Jerusalem, Galilee, wilderness and shore will show the backdrop to God at Work – past, present, future. The exhibition will showcase the places where key events in the life of Jesus happened including Cana where he performed his first miracle; the Judean desert where he fought a spiritual battle against evil; the first Easter in Jerusalem – and many more. By recreating these scenarios the people of St Andrew’s hope to help people to visualise what the life of Christ might have been like and to make the stories of the New Testament more alive and vivid. Alongside the locations there will also be displays of flowers linked to the stories of Jesus’ life highlighted by the exhibition. Visitors will be able to follow a story-trail and a timeline of Jesus’ life, and see how the concerns Jesus had for the people he met continue to inspire Christians today. The exhibition will be open to pre-booked schools on weekday mornings and to the general public from 1.00pm. Over the weekend of 24th-25th it will be open to all from 10.00am on Saturday, and Sunday from 11:00am with special events during the evenings – details of these below.